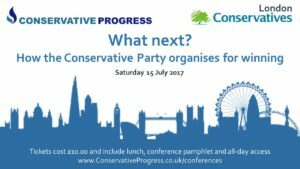 Conservative Progress – What next? I’m very much looking forward to joining Conservative Progress on Saturday July 15th. The focus of the event is to look at how we engage with people even more in future, especially in London. It’s going to be a really positive event, looking at where we are what we need to do to get the Conservative message across in future. For tickets… click the link below.